The "InDemand" is a 48' Sportfisherman with A/C, stereo, TV with VCR & DVD, Freezer & microwave oven. 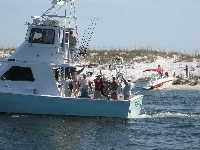 David Gates grew up in Destin fishing it's waters & has been a liscensed Captain since 1982. The "InDemand is Coast Guard approved for up to 18 passengers. Rates are less for private harbor cruises.